8th-grade students in the STEAM-oriented Making Music class are applying their Conceptual Physics knowledge to explore the acoustics of music. They are also receiving a hands-on education in the importance of good design, precise measurements, and an engineer's problem-solving mindset, by building various stringed and percussion instruments. Last week, the group had an opportunity to see how the professionals at Taylor Guitars, the top manufacturer of acoustic guitars in the United States, seamlessly combine art, skill, and technology to produce quality products. 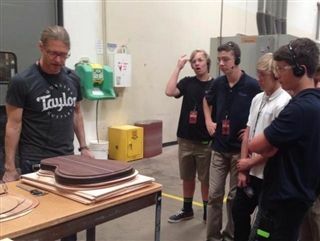 During a tour of the Taylor factory in El Cajon, the group witnessed the entire guitar construction process, from wood selection to final assembly.